I Killed The Prom Queen are known for their fantastic live show, and it looks like they're not cutting corners for Warped Tour. 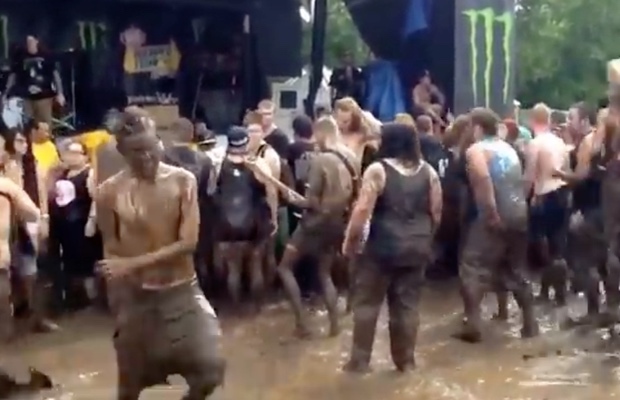 Fan video has surfaced depicting guitarist Jona Weinhofen playing his parts from the crowd, in ankle-deep mud at the Nashville date. This is an impressive feat, considering the size of I Killed The Prom Queen's crowd and the energy on display throughout the set. Hopefully his guitar survived the mud (but we're betting it didn't). Check out a few videos below.